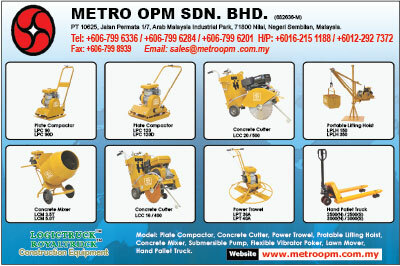 METRO OPM SDN BHD (Metro Oringinal Product Malaysia Sendirian Berhad) was specialist established in year 2005 to realize the team’s vision of supplying light and heavy machineries to both the domestic and international markets. The company manufactures material handling equipment, drum handling equipment and water cooling tower industries. Today, METRO OPM SDN BHD products are widely supply to others country like Middle East, Asia Pacific, South East Asia, Europe, North and South America. 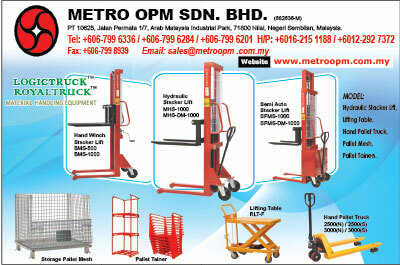 METRO OPM SDN BHD product range includes HYDARARULIC HAND PALLET TRUCK (MANUAL, SEMI AUTO & FULLY AUTO HYDRAULIC STAKER LIFT), DRUM TROLLEY (MANUAL, SEMI AUTO & FULLY AUTO HYDRAULIC DRUM DUMPER), FULLY AUTO PNEUMATIC DRUM DUMPER, PORTABLE NESTAINER, PALLET MESH CONTAINER, WORK TAINER, VIBRATORY PLATE COMPACTOR, CONCRETE CUTTER, POWER TROWEL, PORTABLE LIFTING HOIST, CONCRETE MINI MIXER & COOLING TAWER HDG STEEL, 304 & 316 S.STEEL STRUCTURE, COOLING PART & COMPONENTS AND ETC. METRO OPM SDN BHD believes in continuous investment in Product Research & Development, Human Resource Development and in the practice of sound investment strategies. It’s manufacturing plant is domestic in Shah Alam Selangor, Beruas, Perak & Nilai, Seremban, the capital of Malaysia and is equipped with the latest state of the art technologies, for example like the highly automated and accurate Computer Numeric Controlled ( CNC) Lathe & Vertical machines. Mission of METRO OPM SDN BHD is to become the Malaysia No.1 manufacturing Company in five years time. We are striving hard to improve our products and customer services. We are look forward to more double-win co-operations for more fulfillments of social compliance and the interest of human being.